This post contain the richest senators list in Nigeria 2019. It's not a new story,we all know that lawmakers in Nigeria popularly called senators are paid handsomely well. Basically what these lawmakers do is to gather and deliberate on which bill to pass into law. Almost all the senators in Nigeria are rich,majority of these senators have held different political post before,a countable number of senators were former governors. These lawmakers are also seasoned politicians who were elected to represent the constituents of their various states in the National house of assembly. Now that I have brought you up to speed,it's time for us to check out some of the top 10 richest senators in Nigeria that are estimated to be worth millions of dollars. 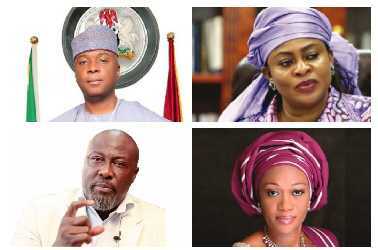 In no particular here are some of the richest senators in Nigeria. Mr Dino is one of the most controversial senators in Nigeria. Dino has gained a reputation of speaking his mind and being very blunt. The seasoned politician is also social media savvy and has gained a lot of followers especially young Nigerians,recently he posted pictures showing his fleet of exotic foreign cars. Dino Melaye is among the richest men in Kogi state,and it is said that the senator has other businesses as well. Dino is currently under the flag of the All Progressive Congress where he represents Kogi west constituency. Bukola Saraki is one of the richest senators in Nigeria,infact he is the current senate president in Nigeria. It is also rumored that he is the richest senator in Nigeria and Africa. Before Bukola became a lawmaker,he was the former governor of Kwara state for two terms. He is estimated to be worth billions of Naira. Bukola represents Kwara Central senatorial district and he is also a member of the current ruling party in Nigeria,the All Progressive Congress (APC). Godswill Akpabio is a seasoned Nigerian politician that was the former governor of Akwa Ibom state. Godswill is also a lawyer,he represents Akwa Ibom North-west senatorial district and currently he is the Senate’s Minority Leader. A lot of the projects in Akwa Ibom state was built during his tenure as the governor of Akwa Ibom state including the ultra-modern stadium in Uyo. Mr Godswill is a member of the PDP and one of the richest senators in Nigeria. Stella Oduah is one of the richest senators that can give the make senators a run for their money any time any day. The rich senator is a member of the People Democratic Party,she represents Anambra north. Stella was once a minister under the Goodluck Jonathan led administration. Oluremi Tinubu is wife to one of the most influential figures in Nigerian politics. Oluremi Tinubu is the wife of Chief Bola Tinubu. She is one of the lawmakers that has served for a long time in the National Assembly. Oluremi Tinubu is a member of the APC and represents Lagos central senatorial district. Democratic party before he switched to the APC. The lawmaker represents Anambra south. According to speculations,David Mark is one of the richest senators in Nigeria. He was the former president of the 7th senate,and rated as one of the richest senators in Nigeria worth billions of Naira. The lawmaker served in the Army and retired as a Nigerian Army General. Popularly called T.A Orji,the former governor of Abia state is rated as one of the richest senators in Nigeria and also one of the most hated politician in Nigeria,he was accused by his statesmen of squandering the states money during his tenure as the governor of Abia State. He is also on the richest senators list. Ali Ndume is one of the richest senators in Nigeria. He was elected to the Senate for Borno South, under the umbrella of the People's Democratic Party (PDP). Ali Ndume was the Senate Majority leader in the Nigerian Senate House after the 2016 elections but was later impeached by APC Senators. He is rated as one of the richest senators in Nigeria. Mr Murray Bruce is a media mogul and owner of the popular media group Silverbird group. Mr Ben is from Bayelsa state and is known for his “common sense” speeches which he makes on social media and television. Having had a successful career as a media mogul he is also among the top 10 richest senators in Nigeria. Mr Ben Murray Bruce represents Bayelsa east senatorial district,under the People Democratic Party (PDP).